Combining audio with extreme portability and visuals is something commonly done with synthesizers, but probably never this easily. As part of an event held at the Royal Academy in London called “Sensing Spaces,” it’s a multi-sensory feast. The title for the device is ironic: ‘Contact.’ It would appear the user is strumming strings or hitting bongos, but when the lights go up, the impressive fact is that it can turn almost any hard surface into an arranger-style synth. The system of touch acoustics is driven by contact microphones, passive sonar and waveform analysis. 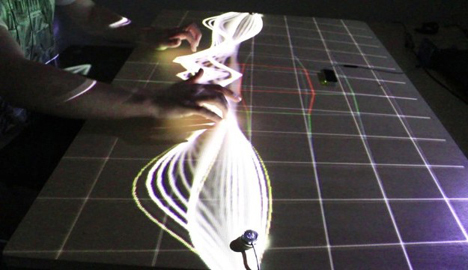 Created by visual artist Felix Faire, Contact’s audio is processed through software platforms Ableton Live and Max/MSP. After volume adjustments are plotted along an X/Y axis, with a few flicks of the wrist, electronic music tracks become audio-visual treats. See more in Art of Tech or under Technology. February, 2014.